I am a junkie. A makeup junkie. I always have been, and always will be a dedicated lover of makeup. My addiction started as a young teenager when I purchased my first Maybelline mascara in the pink and green tube. I loved it then, and continued to love it for many years thereafter. As I grew older, I slowly added other cosmetics to my beauty regime including (but not limited to) eyeshadow, foundation, bronzers and eyeliner. In my college years, I was a dedicated wearer of “Indian Earth,” a bronzing powder which came in a little clay pot. As a career woman, Lancome eye pencils were my “go-to” eyeliners, and remained so for 20 years thereafter. As time marched on, Chanel lip products were my biggest splurges. I was extremely loyal to my favorite makeup items, and I spent a lot of time searching for them. As one might expect given this history, my world was a bit rocked when I chose to trade in my longtime “favorites” for cosmetics which were cruelty-free and animal-free (not that I’m sorry!). Ditching leather jackets? No big deal. I always felt “off” wearing animal skins anyway. Leather shoes? Easy give up. I don’t live and die for shoes as many women do. Handbags? I love them, but I immediately found non-leather replacements which I love just as much. Makeup? Whoa, not so easy! Thank goodness, when I became vegan my children were growing older and didn’t need as much of my time as they did when they were little. Life was good, and I was able to explore just about “anything and everything” related to my new lifestyle. This included books, DVDs, food, restaurants, ethical clothing, accessories and cosmetics. My newly acquired information was the major reason I started this website. I felt like a sponge soaking up everything related to veganism, and I wanted to share all of “my finds” with anyone who was interested in knowing about them. My makeup hunt began 4 years ago, and has continued to this very day. If you’ve been following my site, you know that I am a dedicated user of several of Tarte’s vegan cosmetics including Tarte’s Amazonian Clay BB Cream, “Lights, Camera, Lashes” Mascara, Park Ave Princess Bronzer, Amazonian Clay blushes, and Lipsurgence lip products. There are so many other great vegan-friendly and cruelty-free cosmetic brands out there including Juice Beauty, Obsessive Compulsive Cosmetics, Beauty Without Cruelty, Gabriel, ELF, and more! On several of my recent trips to Sephora, I couldn’t help but find myself drooling over the beautiful colors showcased on the Urban Decay display. I knew that Urban Decay was a cruelty-free, vegan-friendly company, and it was only a matter of time before I would be sampling their products. Although I didn’t want to spend money unnecessarily (they are a bit pricey), I had been ogling some of their pretty products for quite some time. Finally, on my birthday last week, I decided to spurge on several items. I had been using Urban Decay’s 24/7 Glide-On Eye Pencils for a few months (review below), so I was confident that I would like other products in Urban Decay’s line, as well. I was right! As far as eyeshadows go, these 12 neutral shades are all that any girl will ever need. I was drawn to this palette from the very first time I laid eyes on it. It’s no wonder that it’s become my new staple beauty product. The Naked Palette is beautifully packaged, and comes with a “Good Karma” Eyeshadow Brush and Eyeshadow Primer “Potion.” I love mixing and matching all the shades which range from light satins to shimmering browns to basic mattes to deep smokey colors. Just about any look can be created with this kit, from an everyday daytime look to a sultry evening look, and everything in between. The shadows glide on effortlessly, and I love the intensity of the pigments. Please note that I am light-skinned, but I think the colors would work well on many skin tones. It’s also worth checking out Urban Decay’s Naked Palette 2 to see if you might like those colors better for your skin tone. *Note: In response to one of the reader’s comments, I did further research and she was correct. Some of the colors in this eyeshadow palette and in the “Flushed” compact below “may” contain carmine (a non-vegan product) and, therefore, the products may not be vegan. However, the 24/7 Glide-On Eye Pencil in Perversion (Sabbath may contain carmine) and the Naked Skin Weightless Ultra Definition Liquid Makeup are vegan. Sorry for the oversight! 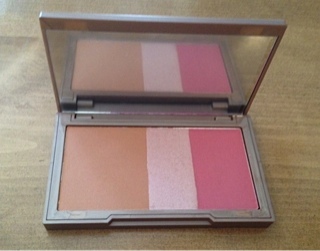 This combination bronzer, highlighter, and blush is gorgeous, gorgeous and more gorgeous! You can wear either the bronzer, highlighter or blush alone, or mix any combination of them. The bronzer provides a radiant facial glow without being too dark or overwhelming. Although the blush looks a bit bright in the compact, the color is more subdued when applied giving your cheeks that perfect “flushed” look. The highlighter provides a radiant finishing glow whether worn alone or in combination with the blush and bronzer. I have light skin, and this Naked Flush combination is perfect for my coloring and for every day use. Since you can build with it to make the colors more and more vibrant, I believe that this product will work on a variety of skin tones. I really love it, and can’t recommend it enough. Believe it or not, I haven’t worn foundation since I became vegan 4 years ago. I’ve been wearing Tarte’s Tinted Moisturizer and BB Cream, even on special occasions. However, I’ve been on the hunt for something a little bit “more” to wear when going out on Saturday nights or special occasions. 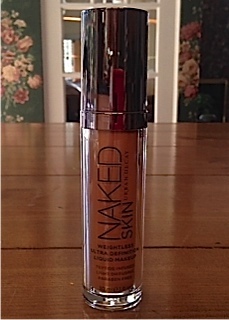 Urban Decay’s Naked Skin Liquid Makeup is exactly what I was looking for. It gives my face a more polished look than my BB Cream, but doesn’t look cakey or too much at all. In fact, it truly feels weightless and light, and provides just the minimal amount of coverage my skin needs. I trusted the sales person at Sephora to help me pick my shade which is the 5.0. I was a bit skeptical because the 5.0 is a “medium” shade and I’m light-skinned, but somehow it’s perfect for my complexion. Although I love this makeup, it may not be for you if you need heavy coverage for any reason (eg. to camouflage scarring). This product is truly lightweight and natural, and gives your skin a luminous finish. I use my fingers to apply it, but Urban Decay suggests buffing it onto your skin with a “Good Karma Optical Blurring Brush.” I might consider purchasing that too. Urban Decay Naked Skin Weightless Ultra Definition Liquid Makeup is paraben-free and infused with nourishing ingredients such as antioxidant green tea and vitamins. I purchased Urban Decay 24/7 Glide-On Eye Pencils in 2 colors several months ago: Perversion and Sabbath. Perversion is a strong black, and Sabbath is a deep smokey blue (almost a navy). These waterproof eye pencils are very gel-like and, therefore, quite dramatic. They glide on beautifully, and they stay on for the entire day needing no touch-ups once applied. The colors I picked are really great, but I wear them only at night because they are bold. However, I really love them and use them quite often. If you are looking for vibrant gel-like eye pencils with long staying power, then these eye pencils are for you. I am considering purchasing a brown or purple color for a more daytime look. Since I’m so impressed with the products I purchased, I feel confident in recommending Urban Decay to anyone searching for a fabulous new line of cosmetics. The fact that Urban Decay is a vegan-friendly and cruelty-free company is just the icing on the non-dairy cake. The colors are gorgeous, the packaging is beautiful, and the make-up looks amazing when applied. 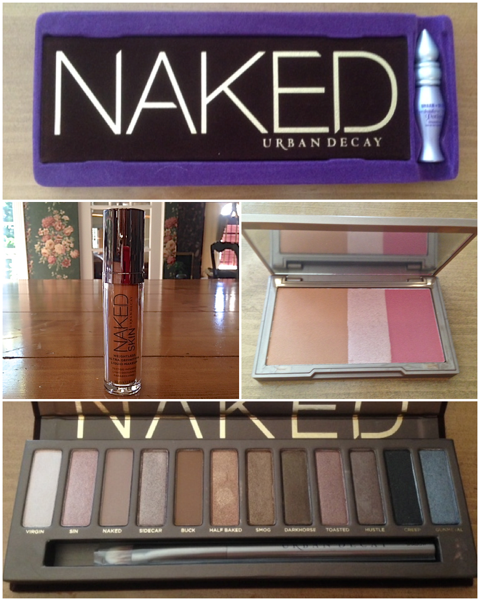 It is my opinion that Urban Decay can compete with any other leading cosmetic brands on the market today. I believe that I’m well-qualified to make such a strong statement because I am a junkie. A makeup junkie. I always have been, and always will be a dedicated lover of makeup. 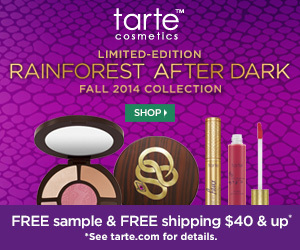 Click here to read Tarte Cosmetics Are Oh So Sweet! Debby, I STILL use that pink and green Maybelline mascara, and I LOVE Urban Decay eye shadow palettes. My daughters and I use them and love them. Glad to know we are using a “friendly” brand! Excellent! Yes, you guys are using a cruelty-free brand of makeup. Keep up the good work. The Nakeds is so popular that our Sephora is out of them half the time. I think they make great products and I say that as a makeup junkie too! On their website, Urban Decay states on their ingredients list that “ALL” their products “May Contain” CI 75470 (Carmine). Carmine is made from Cochineal Beetle wings…and is not generally considered Vegan. Urban Decay is Not Vegan unless this has changed….right? …although some colors may qualify. You are correct. I just checked again and it appears that some of their products may not be vegan. You are correct in that carmine (made of crushed bugs) is not vegan and that some of the eyeshadows and blushes “may” contain carmine. I amended my post in response to your astute comment. Thank you! After I posted, I realized that only some of Urban Decay’s products are vegan, and not all of them. My deepest apologies! You can contact Urban Decay and they will send you a list of all their products which are vegan. 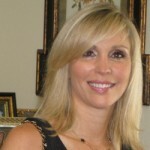 Debby, as a vegan and a makeup junkie, you owe it to yourself to check out the cosmetics, skin care, and hair care from 100% Pure. ALL their makeup is tinted with organic fruit. There are quite a few brands I love and trust (Gabriel, Ecco Bella, Dr. Hauschka, etc.) but 100% Pure rocks my world! Health and peace. I’ve been meaning to try 100% Pure. I read about it on Veg News, and it’s on my “to-do” list. Thanks so much for leaving the comment. Can’t wait to try! Are there any recommendations for a waterline or rim liner for sensitive eyes? I like the kohl colors but often the ones I have tried cause watery, irritated eye. Appreciate your help. Have you tried e.l.f. products? They are vegan and very inexpensive and are really good!